Horse racing got a lift from its first Triple Crown winner in 37 years last year. The first test of whether there will be any lasting effect from that win comes this Saturday with the 142nd running of the Kentucky Derby. Last year's winner American Pharoah has already been retired to a nearby stud farm and a new crop of 3-year-old thoroughbreds will take to the track for the sport's highest profile event. Horse racing is a lot less popular than it was the last time there was a Triple Crown winner, which was in 1978 when Affirmed won the Kentucky Derby, the Preakness and the Belmont Stakes. The slide in racing's popularity has been going on for decades. Still the Derby has remained a high profile event. Tickets sold: Last year there were a record 170,513 tickets sold for the event. That makes it one of the largest sporting events in the country in terms of attendance, larger than the crowd for any team sport. Ticket prices: General admission tickets are $60 each. Tickets for a seat in the grandstand can range from $184 for the cheapest Saturday-only ticket to $12,500 for a two-day ticket covering Friday and Saturday cards. Suites that can hold 40 people cost $250,000 for the two days. Grandstand seats are going for about $600 on the resale market, according to sites such as SeatGeek and Vivid Seats. SeatGeek says those prices are up about 2% from a year ago. Amount wagered: $138 million was bet legally at tracks and off-track betting outlets last year. Of that, nearly $12 million was bet at Churchill Downs. And the Derby is just one of 14 races that will be run this year. Last year a total of $194 million was bet on what was then a 13-race card, with nearly $23 million of that wagered at the the track. 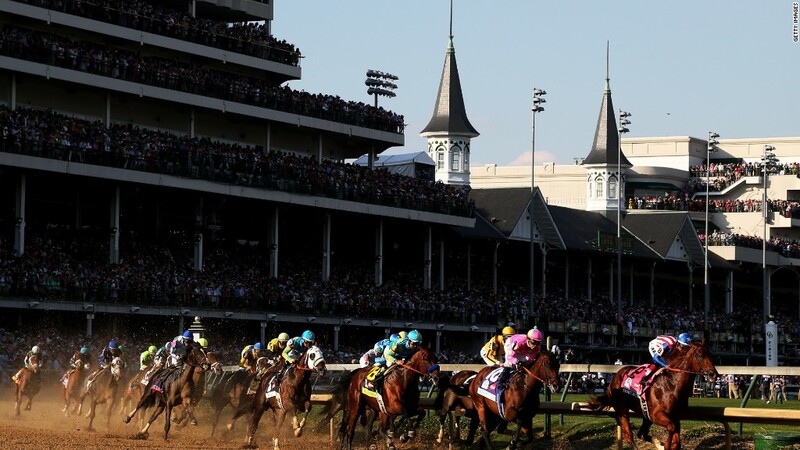 Churchill Downs (CHDN) makes about half of its money for the year during the Derby and the week leading up to the race. Entry fee and prize money: The Derby costs $25,000 to enter, and an additional $25,000 when the horse actually makes the start. The purse is likely to be about $1.6 million for the winning horse, up from $1.4 million last year. An additional $760,000 will go to the other top finishers. Jockey pay: Jockeys get 10% of the purse if they ride the winning horse, 5% of the prize money for finishing second or third. But most of the jockeys will only be paid a $500 mount fee for riding in the race, and will have to pay about $150 of that to their agent and valet, who is a jockey's assistant. Who's there: Vivid said nearly 30% of people buying tickets on the resale market come from Kentucky or neighboring Indiana. But California is the second biggest market for tickets, with about 8% of the crowd. It is one of the biggest sporting events of the year for attracting private jet traffic, according to Brad Stewart, CEO of XOJET, in the tier of four or five events just behind the Super Bowl. There were 658 private jet flights to and from Louisville on Derby weekend last year, and XOJET has seen a 25% jump in its Derby flights scheduled for this year.